Premium, metallised emulsion floor polish for prestigious areas. Dries to an extra durable, brilliant, wet look, slip resistant finish. • Ideal for very high traffic areas. 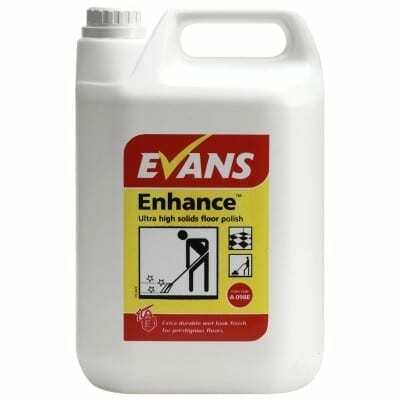 • Excellent levelling properties for easy application and to ensure a smooth even finish. • Suitable for most hard floors including vinyl, rubber, linoleum, terrazzo & sealed surfaces. • Coverage per 5 L – 400/500 sq. metres for 1 coat. 1. Ensure floor is clean, dry & neutral. 3. Pour polish into clean bucket or tray, alternatively pour directly onto the floor in a thin line. 5. Leave to dry for approximately 30 minutes. 6. Apply a further coat of polish thinly & evenly at right angles to first i.e. NORTH to SOUTH. Leave a 10 cm gap at the floor edge to avoid a build up. 7. Leave to dry for approximately 30 minutes. 8. A third coat may be required in heavy traffic areas or on old or worn floors. coalescent, defoamer, levelling agent & preservative.